Whit's Mobile Marine is a 100% mobile business that services all boats and watercrafts in the Lake Sammamish, Lake Washington and surrounding areas. Whether it is on land or on your dock, you can be sure we have you taken care of! We also have a dry storage lot that is conviently located to store all your boats, jetski's and trailers. Please call 206-491-2299 or contact us online to setup up an appointment. We service the Greater Seattle area. 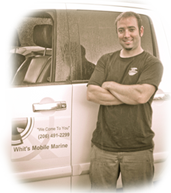 Born and raised in the Northwest, Jeff Whitwer of Whit's Mobile Marine has been in the marine industry for over 15 years. He graduated from MMI in Orlando, FL and then moved back to the Seattle area working for Bakes Marine Center in Issaquah, Wa. After 10 years of service he and his wife moved back to Florida to the Cape Canaveral area to gain a wider knowledge of the industry. He worked for Mobile Marine Florida as a mobile boat technician, servicing boats in customers driveways or on their docks. Enjoying the mobile industry so much he has now moved back to the Northwest to start his own business to provide great mobile service to you. We also have a storage lot on private property. It is located the in Canyon Park area and is gated and locked. We can accommodate boats, skiis, cars and trailers - anything taking up space. We also offer personal towing to and from the location for the items being stored. Please call us or email us for pricing and details. © 2012-2013 Whit's Mobile Marine. All rights reserved.